Cup of Coffee 5/15: The affiliates earned an even split on Saturday, coming away with three wins and three losses. The PawSox and Sea Dogs each played and split doubleheaders, with Eduardo Rodriguez and Brian Johnson both turning in mixed-bag outings for Pawtucket. Sam Travis homered on a night where Andrew Benintendi, Nick Longhi, and Yoan Moncada reached base four times for Salem. Henry Ramos (pictured) and Ali Solis were offensive standouts for Portland. Eduardo Rodriguez made the fourth start of his rehab assignment in the first game of Pawtucket's doubleheader on Saturday afternoon. The southpaw lasted 5 2/3 innings, allowing three runs on seven hits while striking out three. With SoxProspects.com director of scouting Ian Cundall sitting in on the game, Rodriguez again struggled with velocity, sitting in the low 90's, but exhibited better control as he walked none and threw 71 strikes in 100 pitches. Noe Ramirez pitched in relief, tossing 1 1/3 shutout innings, allowing a hit and a walk. 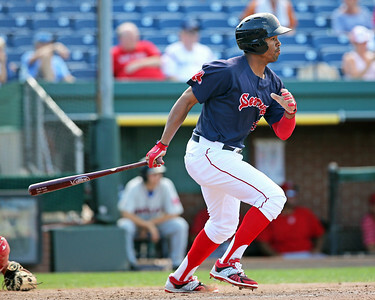 The PawSox bats were quiet in a low-scoring loss. They scored their first run in the second inning when Chris Marrero scored on an RBI single by Bryce Brentz, who was 3 for 3 with a double. Brentz came in to score Pawtucket's second run of the game in the fifth, scoring on a sacrifice fly by catcher Sandy Leon. Blake Swihart was 1 for 2 with a walk and started in left field. After a poor performance in the first game of the double-header, Pawtucket's bats came to life in game two. The PawSox scored single runs in each of the first three innings before really breaking out with a five-run fourth inning. Mike Miller and Sean Coyle recorded base hits to start the inning before a two-run double by Rusney Castillo. The PawSox then piled on with a two-run homer by Sam Travis, which was immediately followed by a home run off the bat of Chris Marrero. Another promising lefty drew the start in the second game of the double-header as Brian Johnson got the call for Pawtucket. Johnson allowed three runs early but settled in later despite a shaky line of six runs and five walks in just five innings. Johnson improved to 2-3 with the win but raised his ERA to 4.91 this season. Wesley Wright and Kyle Martin followed Johnson's start with scoreless innings of relief. The Sea Dogs exploded in the first game of their double-header, scoring 13 runs and routing Binghamton. Portland jumped out of the gates with a bang as leadoff hitter Henry Ramos homered to start the game. The Sea Dogs continued to pile on in the first, scoring a run on an RBI single by Rainel Rosario and then three more on a double by Ali Solis, who was 2 for 3 with a homer, a double, and six RBIs. Ramos notched another home run in the second inning, turning in a 3-for-4 game with a double and two home runs. The Sea Dogs had help up and down their batting order as six hitters-- Ramos, Aneury Tavarez, Ryan Court, Cole Sturgeon, Rosario, and Solis-- recorded multiple hits. Portland also received an excellent start by Teddy Stankiewicz, who threw a complete game, allowing two runs and striking out four in seven innings. Stankiewicz is in the midst of a strong season for Portland, pitching to a 3.32 ERA with a 27/8 K/BB in 40 2/3 innings pitched. Portland was unable to follow up their huge first game with another notable performance, scoring only three runs. All three of their runs came in the fifth inning, coming on an RBI single by Derek Miller and a two-run homer by Cole Sturgeon. Sturgeon is now batting .269/.313/.389 in 28 games with Portland this season. Mitch Atkins started on the mound for the Sea Dogs, lasting only three innings and giving up three runs on five hits and a walk. Nik Turley allowed four runs (two earned) in 2 1/3 innings of relief. Simon Mercedes closed out the game with 1 2/3 scoreless frames, lowering his ERA to a still-unsightly 7.16 this season. Salem pulled out an exciting win on Saturday night, walking off in the tenth inning on a single by Andrew Benintendi. The Red Sox scored their first two runs in the first on RBI doubles by Mauricio Dubon and Nick Longhi. Salem kept adding runs in the third, scoring a run when Benintendi stole home and then two more on a home run by Danny Mars. Longhi was the offensive standout for Salem, going 4 for 4 with a double, a walk, and two RBI. Benintendi reached base four times, going 1 for 3 with three walks. Yoan Moncada went 2 for 4 with two walks and three stolen bases. Jalen Beeks battled through four innings on the mound for Salem, allowing six hits and four walks but managing to escape without allowing a run. Beeks struck out four in the game and now owns a 2.57 ERA and 27/13 K/BB in 35 innings pitched this season. German Taveras allowed four runs (three earned) in an inning of relief, walking five batters. Taylor Grover then pitched well in three innings of relief, allowing a run and striking out four with no walks. Ben Taylor allowed two runs in two innings but got the win when Salem walked off in the tenth. Daniel Gonzalez started on the hill for the Drive on Saturday night and turned in a quality start. Gonzalez pitched six innings, allowing three runs with seven strikeouts and only one walk. He was relieved by Jeffry Fernandez, who allowed two runs in two innings pitched. The Drive were never able to get anything going offensively in the shutout loss. Luis Alejandro Basabe was 2 for 3 with a walk, raising his slash line to .275/.359/.407 this season. Roldani Baldwin was 2 for 4. Player of the Night: Henry Ramos had a day to remember in Portland's double-header on Saturday. Ramos distinguished himself in game one, going 3 for 4 with two home runs and a double, and then went 1 for 3 in the nightcap. Ramos is now batting .260/.318/.420 with three home runs in 27 games for the Sea Dogs this season. Now 24 years old, Ramos is starting his third consecutive season in Portland after dealing with injuries throughout the last two seasons.